Holidays are meant to have fun and relax, so why not do it with your family and friends and get away from your daily routine? Enjoy our holiday promotions and book your stay at a cheaper price. 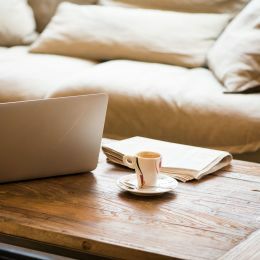 * Offer non cancellable / non refundable bookable only online on www.brithotel.com for a stay between 6 July and 2 September 2018, subject to availability. The Brit Hotel L'Acropole, located in Angers, has 56 rooms, a restaurant and a swimming pool. The Brit Hotel Nantes Beaujoire - L'Amandine is a hotel/restaurant located in front of La Beaujoire stadium. This hotel/restaurant has 63 comfortable rooms. 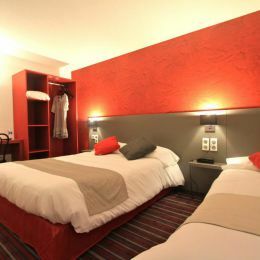 The Brit Hotel Antares*** is located just 5 minutes away from Orléans city centre. This hotel/restaurant has 62 comfortable rooms. 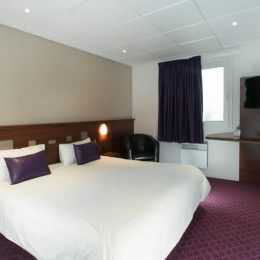 The Brit Hotel Agen – L’Aquitaine is a 2-star hotel/restaurant with 40 air-conditioned rooms. 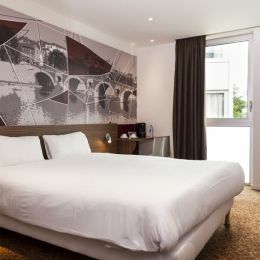 The Brit Hotel Nantes Vigneux - L'Atlantel has 86 spacious and comfortable rooms. 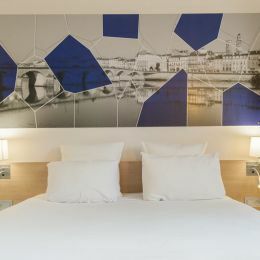 The Brit Hotel Bleu Nuit is a 2-star hotel located in Saintes city centre. This hotel has 29 rooms. 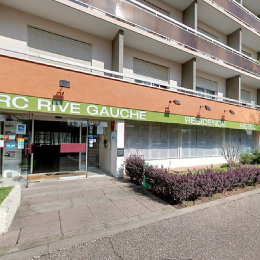 Located 10 minutes from Rennes city centre. 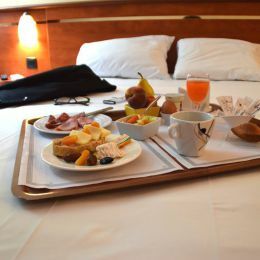 Brit Hotel Rennes - Le Castel offers 60 renovated rooms and a high quality restaurant. The Brit Hotel Le Cottage is located south of Le Mans, it has 66 comfortable air-conditioned rooms and a traditional restaurant. The Brit Hotel Dak'Hôtel offers 27 fully equipped rooms and an outdoor swimming pool in a green setting, with easy access. Discover the Brit Hotel L'Adresse located in L'Arbresle near Lyon! 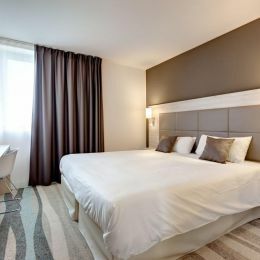 Brit Hotel Rennes Cesson - Le Floreal is a 3-star hotel/restaurant with 51 fully renovated rooms. 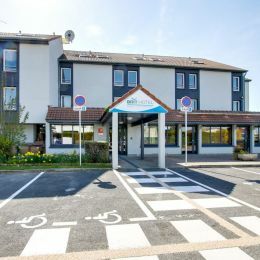 This hotel is located in Rennes Cesson-Sévigné. The Brit Hotel Nantes St Herblain - Le Kerann is a hotel/restaurant near Nantes, in Saint-Herblain. 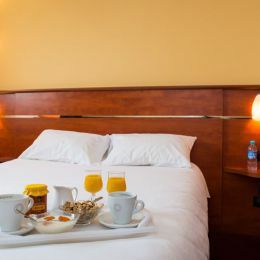 The Brit Hotel Brest Relecq-Kerhuon is located less than 10 minutes away from Brest city centre and has 43 comfortable rooms. Front-desk is open 24-hours a day. 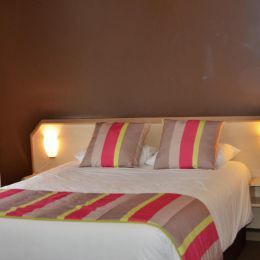 The Brit Hotel Kerotel is located in Lorient, only 5 minutes from the sea. The hotel has 50 rooms. The Brit Hotel Le Magdalena is a 3-star hotel/restaurant which has 38 rooms and a traditional restaurant open from Monday to Thursday. 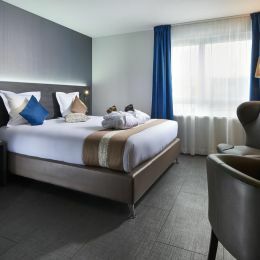 The Brit Hotel Blois - Le Préma is located 10 minutes away from Blois city centre. This hotel has 43 air-conditioned rooms and a restaurant/bar. 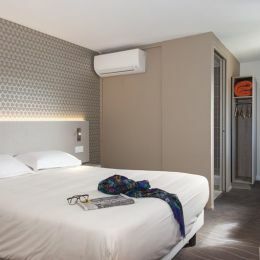 The Brit Hotel Bordeaux Aéroport - Le Soretel is a 3-star hotel/restaurant located near Bordeaux Merignac Airport offering 60 air-conditioned rooms as well as a restaurant. 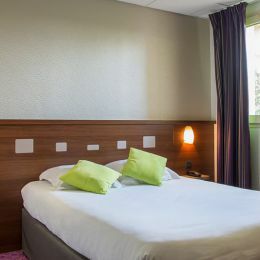 Brit Hotel Rennes St Gregoire - Le Villeneuve is located just 10 minutes from Rennes city centre. 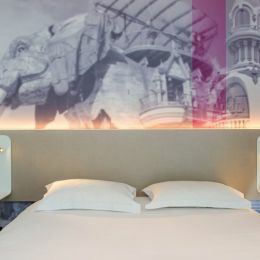 The hotel/restaurant, completely renovated in 2011, offers 56 rooms and traditional food based on local produce. 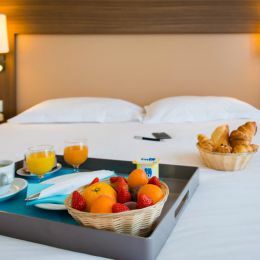 Located on the outskirts of the city of St Malo, facing the Grand Aquarium Saint-Malo, the Brit Hotel Saint Malo - Le Transat offers 53 comfortable rooms, and restaurant. 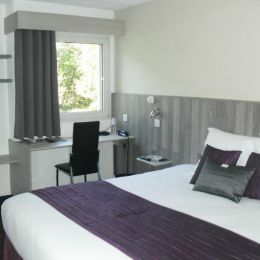 Open since July 2009, the Brit Hotel Atalante Beaulieu*** offers 64 rooms. 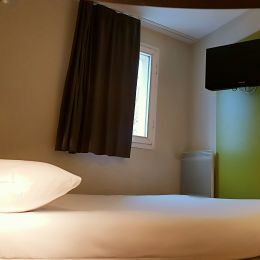 Only 10 minutes away from Rennes city centre. 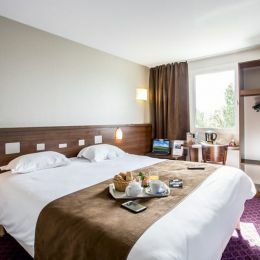 The Brit Hotel L’Adresse is a modern hotel located in the heart of the Brocéliande countryside. 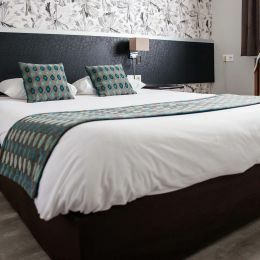 The Brit Hotel Tours Sud - Le Cheops, located in Joué lès Tours, welcomes business travellers and tourists alike. It has 58 renovated rooms. The Brit Hotel Parc Rive Gauche is located on the banks of the Allier river and near the parks of Vichy. This hotel has 50 rooms. 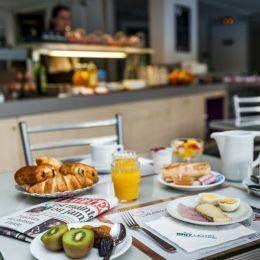 The Brit Hotel Toulouse Colomiers – L’Esplanade is located in Colomiers, a town next to Toulouse. 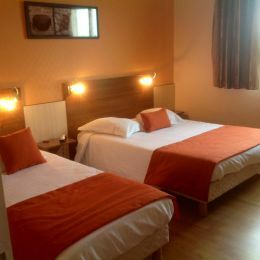 The hotel offers 42 comfortable air-conditioned rooms as well as quality dining. Enjoy the panoramic views of the Lot valley from the outdoor swimming pool of the Brit Hotel Vallée du Lot - Fumel. This hotel has 32 rooms and a restaurant. The Brit Hotel Le Relais du Vern is located in Landivisiau. This hotel/restaurant features 52 rooms, where everything is provided for work and relaxation. 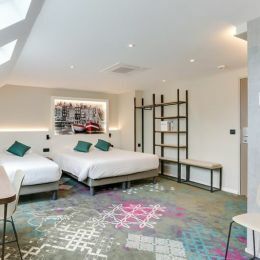 The Brit Hotel Avignon Sud – Le Calendal is a 3-star hotel with 41 rooms, a heated (28°C) swimming pool, a restaurant open on weekdays and a meeting/conference room that can accommodate up to 40 people. 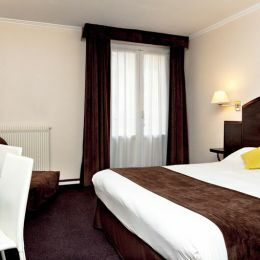 Discover our 79 room hotel located in the centre of Colmar. 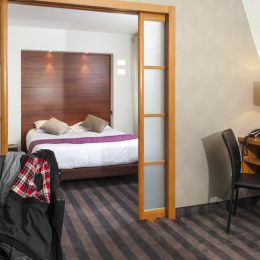 The Brit Hotel Mâcon Centre Gare is located in the city centre and close to the train station. It has 56 comfortable rooms. Discover the Brit Hotel Le Lodge, our new hotel in Strasbourg. The establishment of Belfort Centre - Boréal is a 4-star hotel with 52 air-conditioned rooms. Our staff is present 24 hours a day to serve you and meet all your expectations. 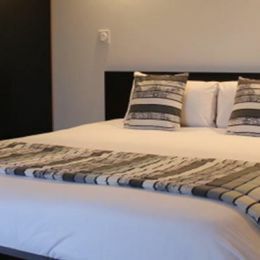 The Brit Hotel Le Cygne located in Saint-Hilaire-du-Harcouët Manche has 28 comfortable rooms. Welcome to the Brit Hotel Caen Nord - Memorial located a few meters from the famous Caen Memorial. 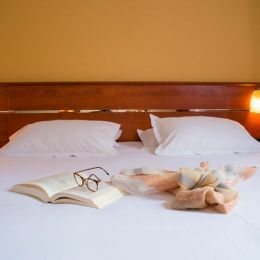 Hotel 3 stars, we offer 75 rooms for all types of public (tourism, business, groups, families) and are 10 minutes away, in direct access from the hotel. 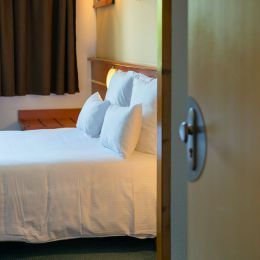 All of our 72 rooms will welcome you. Welcome to Brit Hotel Cahors - Le Valentré, 2-star hotel with 31 rooms. 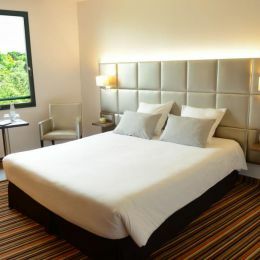 The Brit Hotel Cahors - Le France, a 3-star hotel with spacious comfort, offers 39 rooms, all air-conditioned. 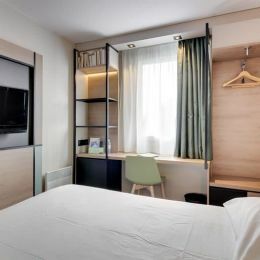 Discover our 4-star hotel in Mulhouse.